You can learn tricks on a BMX bike at our Mobile Rec Day? Why Is the Auditorium Closed Sometimes? 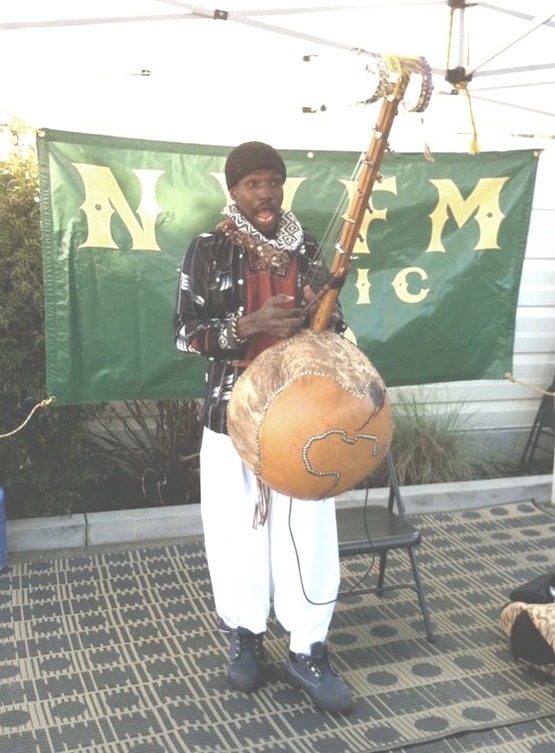 Concert Maestro Richard Hildreth, who is also responsible for music at the Saturday Noe Valley Farmer’s Market, hopes to host some of our concerts outside in the playground. Weather permitting, that’s where Diarra will play, ending at noon. 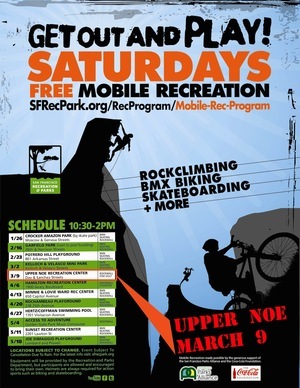 Prepare to climb the walls and ride the rails Saturday, March 9, from 10:30 a.m. to 2 p.m., when Upper Noe hosts Mobile Rec, a new program from the Recreation and Parks Department. Staff will be on hand to help young climbers scale the 30-foot rock wall—three at a time. Any kid who knows how to ride a bike can take it to the next level and learn BMX tricks on the ramps and rails provided. Please consider helping Ladybug Gardeners for an hour or so while your kids get out and play! The need is desperate. See story below. There will also be an Imagination Station, large foam block pieces ready to be turned into anything a child’s imagination can create. Bring whatever equipment you have or borrow at the center. Learn more at www.sfrecpark.org/recprogram/mobile-rec-program. 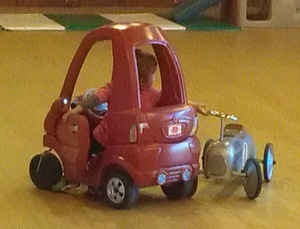 It’s raining and you’ve got a restless toddler, so you figure you’ll take him to the auditorium free-play at Upper Noe. Except that the auditorium is closed and will be for a while. What to do? Let’s say you don’t want a class. What now? Head over to Eureka Valley Rec Center, 100 Collingwood St. (near Diamond and 18th streets), which has a dedicated tot room open 9 a.m. to 7 p.m. Tuesday to Thursday and 9 a.m. to 5 p.m. on Saturdays. For an exhaustive list of citywide options for children of all ages, visit www.sfkids.org. On the weekend, Upper Noe's auditorium and gym are closed when they have been rented. Sometimes it’s a tot birthday party, sometimes it’s a private futsal league. The decision is based on numbers rather than department income, said Facility Coordinator Cheryl Woltjen, who has counted heads. “When I tally it we get maybe at the most 12 people, and only for a couple of hours,” she said of free-play Saturdays. “If you have a party, you have 10 to 20 people plus their parents. You’re serving a bigger population.” Both spaces can be rented on Saturdays and Sundays. To see prices and processes, visit the department's permits and reservations page. Register March 2 for spring classes and March 16 for summer camps, both at 10 a.m. Check out Upper Noe's offerings on our website. 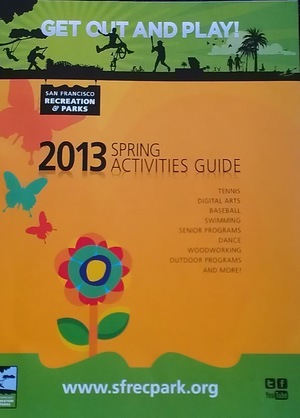 You can enroll for any class at any recreation center or you can register online at www.sfreconline.org. Click the "Browse Programs" tab, go to the bottom of the lefthand column and choose "Advanced Search." Select all courses. When the listings pop up, a pull-down menu on the upper righthand side allows you to narrow choices by facility. You must have a Family Account to register online. Click here to create a Family Account. Finally, you can register in person at Rec and Park Headquarters in Golden Gate Park: McLaren Lodge, 501 Stanyan Street (at Fell). Call 415-831-6800 for help. Scholarships are available to eligible San Francisco residents through the Recreation Scholarship Fund. To find out if you are eligible, please email the department at sfreconline@sfgov.org or call (415) 831-6800 during business hours. For more information, visit the scholarship page of the department's website. The Ladybug Gardeners need volunteers to get down and dirty between 9 a.m. and noon on Saturday, March 9, which coincides with Mobile Rec Day. Staff can teach your kid to rock climb while you give an hour of time toward making our landscape weed- and trash-free! After a series of gardening days that attracted few to no volunteers, the Recreation and Parks Department has had to cut the once-a-month Saturday gardener who directed the work. Lead Ladybug Joan Lionberger said she appreciates the compliments she gets on her work there, but would appreciate volunteers even more. Ladybugs will now meet quarterly: March 9, June 8, September 14 and December 14. To reach her, please email info@noevalleyreccenter.com. Find an egg, pet a bunny and play carnival games at this year’s Spring Eggstravaganza Saturday, March 30, from 11 a.m. to 3 p.m. at Sharon Meadow in Golden Gate Park. Tickets cost $8 (credit cards accepted) and can be purchased in advance—a real time-saver, as the entrance lines get rather long. Last year’s event drew about 4,000 people. For more information visit www.sfrecpark.org/event/spring-eggstravaganza-2013 or call 415-831-6800. 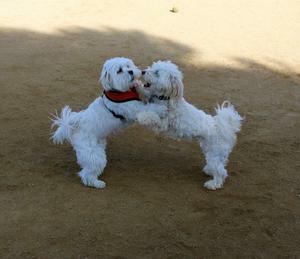 While Coco and Phoebe dance away sunny days in Joby's Run, some of us have work to do. Join us and the Ladybug Gardeners on Saturday, March 9 at 9 a.m. for a joyful morning of weeding and grooming and other chores that make Upper Noe a great place to be! • Lead a new event. Are you interested in organizing a new event at the Center? Maybe a game night or movie night? Please contact us at info (at) noevalleyreccenter.com. 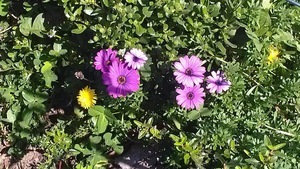 Spiffy up the grounds for spring! Bring gloves and tools if you have them. Learn to climb the rock wall or do tricks on a BMX bike. Bring gear if you have it, but we will also provide. The little ones jam to the West African beat of Yacouba Diarra. Help shape programming and priorities at Upper Noe. 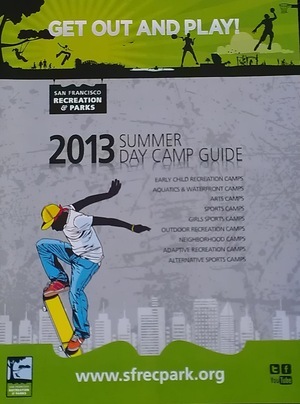 Learn about summer camps, summer jobs, summer classes and more. Carnival rides, egg hunts, rib cook-offs and more fun in Sharon Meadow.